According to the U.S. Census Bureau, approximately 108 million American households own at least one vehicle, with 7.5 million households owning four or more vehicles. But if you’re a vehicle owner who is considering moving to a new state, you might be in for a surprise when it comes to your auto insurance bill. Since each state sets its own insurance rates, owning a car in some states is more expensive than in others. 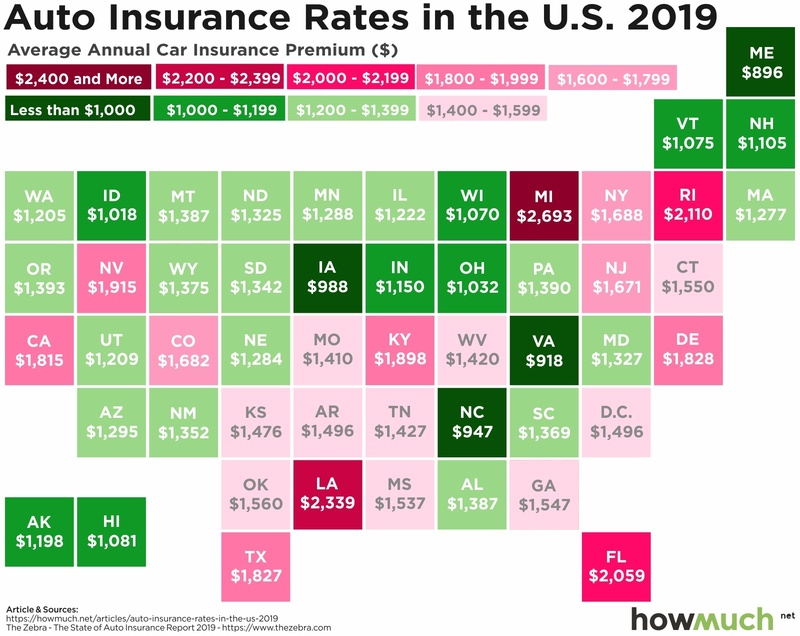 A recent report titled The Zebra State of Auto Insurance 2019 offered a breakdown of the average annual car insurance premiums in every state. From September to December 2018, The Zebra analyzed more than 61 million auto insurance rates nationwide, using information from insurance rating platforms and public rate filings. The Zebra’s findings are shown in our latest infographic, below. According to the Zebra, auto insurance rates are based on five main factors: where you live, what you drive, how you drive, your coverage options, and your demographics (such as age and gender). To ensure consistency in comparing rates from state to state, The Zebra used the same demographic and auto profile for the hypothetical insured user (a 30-year-old single male with a 2014 Honda Accord EX and a good driving history). The Zebra credits a number of more specific factors for the discrepancy in insurance rates across states. States with highly populated cities tend to have higher rates due to the risks involved with traffic congestion, crime, and the greater likelihood of having uninsured drivers. Therefore, northeastern states like New York, New Jersey, and Rhode Island have correspondingly high premiums. Furthermore, The Zebra claims that risks associated extreme weather or natural disasters lead to higher rates. This can account for high insurance rates in states along the hurricane-prone Gulf Coast like Louisiana and Florida, or the states in tornado country like Oklahoma and Texas. With car transportation remaining the most common form of transportation for commuting, understanding how auto insurance affects you is essential. Learn more about different types of insurance using our cost guides.